The final inning. You and the team have made it, and you are either going to have to score, if you are behind, or hang on for the win, if you are ahead. It doesn't matter whether it's softball, hardball, pee-wee, high school, college or pro, everyone who plays baseball is going to face a final inning, and in many cases, what happens here determines the outcome of the game. If you are the pitcher and need to hold on, there are a few things to decide. The first one - how tired is your arm? Sure, you can be all competitive and lay some line on the coach about how fine you are feeling, but a good pitcher knows when their arm is done. Too many pitchers want to finish the game, whether it's for an ego trip, the stats or because they think they are made of iron. If your arm is starting to feel like rubber, you need to understand that it's better for the team if they bring in someone from the pen, and get off the mound. Remember, baseball is a team sport, and there is no "me" in team. If your team is behind and they need some runs, it's up to the batters to make that happen. In many cases, batters that are behind in the last inning, whether it's by 1 run or 10 runs, swing for the fence. They concentrate so much on hitting a slammer that they forget about what wins games - Teamwork! Even if you are only one run down, forget about a homer. If it happens, it happens, but the best course of action is to try and just get a hit. Just make contact with the ball, even if that means laying off the power, or laying down a bunt. Contact is the key, and getting to the base is what matters here, not whacking one over someone's head. Throughout history, big home run hitters always have the most strike outs, while hitters that go for contact have the least strikeouts. In the final inning, if you are behind, it is imperative that you get on base, no strikeouts, no swinging to chop down trees, just make contact so that the batter behind you has a chance to get on base too and keep the rally alive. In a defensive position during the final inning, survival means not making any mistakes. On grounders, always make sure your body is in front of the ball. This is not the time to allow an extra base hit because you are trying to make some spectacular play by scooping the ball on the run and throwing the base runner out. That's a sure recipe for an error, and an error is as good as a base hit. Get in front of the ball, drop to your knees if you have too, but don't let the ball get past you. Take your time out there, call for fly balls, or back up the fielder who calls it before you do. This is especially important on short pop flies when you can have 2 or 3 people running to get the ball. Don't try and be a hero, this is the time when you need to get the job done and get it done right. Call safe pitches. Now is not the time to try and get the pitcher to pitch outside of their comfort zone. Call the pitches that got you into the last inning, call the pitches that are the bread and butter from the pitcher, and call the pitches that you know the pitcher can throw. Now is the worst time to call the experimental screw ball/knuckler/eephus pitch that you and the pitcher have been working on. 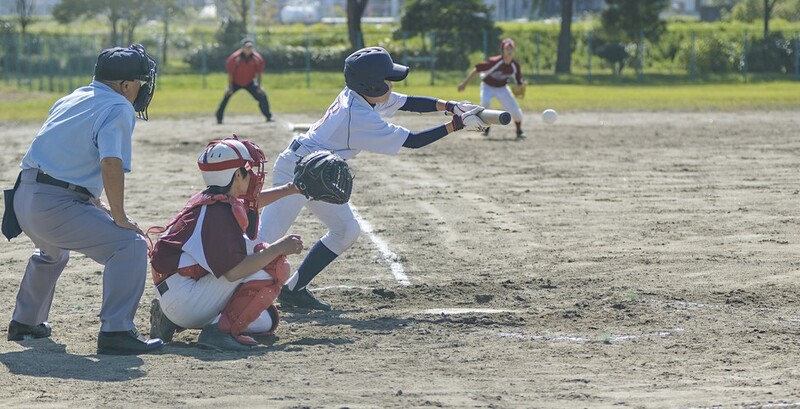 A walk, a hit-by-pitch or a passed ball may be the result, giving the other team another opportunity to score, and possibly resulting in a lost game. On either offense or defense, during the final inning, it is extremely important to keep your head on your shoulders, stay focused and don't do something out of the ordinary. Now is not the time to try and be a hero, it's the time to stay measured and stay in control so that at the final "out," your team is on the winning side after the final inning.